Last time we laid out what is a CSA and what are the benefits of joining. As promised, today we’ll share the significant lessons learned from being CSA farm share members for the past four years. If you’re on the fence or unsure which farm to join, this should clear it up and help you make your decision. This cost usually scares some people off right away because it sounds like a large amount. Keep in mind you are paying in advance for most (if not all) of the produce you will eat during the growing season (and longer if you preserve!). Matt and I make sure to budget for our CSA costs each year so the check we write to the farmer doesn’t hurt as much. If you’re not prepared to pay the lump sum, ask farmers if a payment plan is possible. Farms usually have standard shares, half shares, and some farms even have every-other-week shares available. To decide which share is right for you, consider how often you normally eat at home, how many people you are feeding, and the general eating habits of your family. Farmers are typically very helpful in suggesting a share size that’s suitable for your family. There are many CSAs out there, but the quality offered by farms can differ. Find out whether farms are growing organic or non-organic produce. Some small farms don’t have the money or resources to jump through all the hoops to become certified organic, but they use sustainable practices that are very close to those used on certified organic farms. Ask a few questions to get to the bottom of this very important detail. Do you get to choose the items that fill your box or is produce pre-selected for you? There are positives and negatives to both. The years we received pre-packed boxes, we sometimes did not like items in the box or didn’t know the best ways to prepare them–and I hate to admit, things went to waste. (We started to think our CSA should just be called “Kale Share.”) However, we learned a lot about different produce that would not have otherwise ended up on our table, and were able to experiment with some interesting recipes. When we belonged to a CSA that allowed members to choose produce from a large selection each week, we chose what we liked and were familiar with, so it could easily be prepared and eaten up before spoiling. This Farmer’s Market-style distribution allowed us time to talk to the farmer and enjoy the colors, smells, and textures of the fresh produce. The downside was that we didn’t challenge ourselves to add new variety to our diet, and we mostly stuck with safe recipes, failing to expand our kitchen knowledge. Do you get to choose the distribution site, day, or time? A pick-up schedule that is easily integrated into your summer is a MUST when choosing a CSA. The first year Matt and I were shareholders we were advised to pick up every Saturday between 2-4 p.m. at the farm. We had some obvious problems with this schedule, and ended up not being able to get our produce several times. Do a little legwork to find a farmer offering some options that are more accommodating. 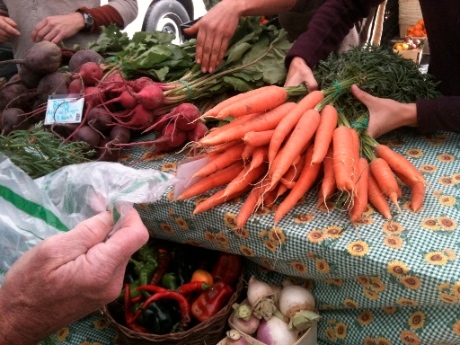 You may be able to pick up weekly at a Farmer’s Market you already frequent. You may get to choose a day and a location that work best for you (and will usually have a window of a few hours to pick up). Better yet, you may be able to find a farmer who delivers right to your front door! As you’re researching farms, it’s important to know how many weeks of produce you will receive. Farms might just offer produce during the regular growing season or they might offer a year-round CSA. The length of your CSA season will obviously affect the price of a share. Do the math to compare farms and determine which offers the best value. Knowing the length of your CSA season will also help you pre-plan for preserving some of the delicious produce. Is the farmer knowledgeable about CSAs? Ideally, you should be able to meet and talk to farmers about your CSA before signing up. This is a good way to find out if farmers are new to CSAs or if they are refining and improving systems from past seasons. CSAs that have been around longer may offer more perks, and will probably be more efficiently organized. We have belonged to newly-formed and also very established CSAs. Our established CSA farmers had so much more to offer, but we built a much more friendly relationship with our novice CSA farmer, who valued us as partners and sought input regularly. Does your CSA offer added bonuses? Oftentimes CSA farmers will grow extra produce to have on hand when shareholders begin preserving foods. Advance orders are taken and a discounted price is charged for such produce. One of our past CSA farmers was very generous, and as he talked to us during pick-up he would often slip a few extra things in our box. If we arrived later during the scheduled distribution time, that same farmer would send us home with extra produce or an entire box another shareholder failed to claim. Farm visits are pretty common among CSAs, but inquire about what this perk entails… you might be very surprised. Some farmers will serve food, give great tours, invite you into their homes, introduce their families, allow you to get down and dirty working on the farm, have children’s activities, and many other cool events. It’s definitely a CSA benefit to look for! Don’t wait until the growing season arrives to begin thinking about a CSA. Most farmers have a limited number of shares available for their CSA and need payment soon so they can plan, purchase seeds and equipment, and plant for the season. Now is the time to start researching farms near you to find out which ones have farm shares available. If you have no idea where to start, check out LocalHarvest.org to find information on CSAs in your area. If you haven’t already looked into it, it’s time to get started! Thank you so much for not only this advice but ALL the wonderful advice and ideas you publish on your site. Just this year I decided to plant a small garden but with time, regular work and health issues it didn’t happen :(. But, after reading your article I can still provide the fresh produce for the family without all the work of growing and I’ll be supporting my local community as well. I’m searching out the best CSA for us and in Memphis TN there are only a few to choose from, we’ll have fresher cheaper orangic foods next year. Thanks again y’all for your support. Sometimes we have grand ideas for gardens too, and end up relying on a CSA instead. 🙂 Good luck with your CSA research, and a big high-5 for trying to feed your family the best food available! Go Wanda! Glad you mentioned this Jeff. We have a savings account we call “fixed non-monthly expenses” where we save for our CSA and all other irregular expenses. Oh, I loved being a part of the CSA at Take Root Farm in Buckley, WA. The lady who ran it was awesome and every year she had a free upick flower and herb garden – the farm was a riot of color and activity and it was so much fun to see what was growing in the fields. We could walk among the rows and see what was happening. I figured out a better way to grow peas from her! That CSA share season was like a gateway drug to starting my own farming practices, so now I just grow it myself. Otherwise I would still be out on her her magical farm, picking sunflowers and cilantro!! We are planning on talking to a CSA this week so this is timely and helpful. As most of the DIY articles usually are! Thanks Jabs and Co.